in account when you desigh a pcb, as a result to minimize the fault measurement of the RTC. Firstly, the crystal should have 6pf capacitance. Secondly the legs of the crystal should be soldered as close as it gets to the chip. And finally around the crystal should exist on the pcb ground plane, so parasitic noises won't interfere on RTC's accuracy. parasitic noises won't interfere on RTC's accuracy. (Fig2) The schematic of the RTC module. This module although it has ground plane on the pcb, the crystal has different capacitance than the recommended, and it is not soldered as close as it gets to chip's pins. This results to capacitance increnment, and the faulty measurement of the RTC. So beware when you are using the particular module and accuracy is required. Below you can see the considarations we talked about for the crystal, taken from the datasheet of the chip which are the proper selection, and the placing on the pcb. (Fig3) The crystal recommendations taken from datasheet. 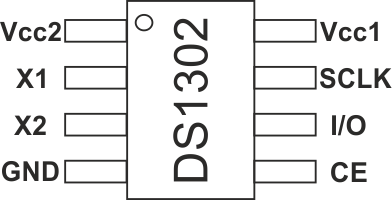 (Fig4) The pinout of DS1302. Now lets make a small analysis of the DS1302 pins. 1 (VCC2) This is the primary power supply pin. When VCC2 is greater than VCC1 + 0.2V, => VCC2 powers the DS1302. When VCC2 is less than VCC1, => VCC1 powers the DS1302. 2-3 (X1-2) In these pins you connect a standard 32.768kHz Quartz Crystal. The DS1302 can be also driven by an external 32.768kHz oscillator. In this configuration, X1 pin is connected to the external oscillator signal and the X2 pin is floated. 4 (GND) This is the Ground pin of the chip. 5 (CE) This pin is the common chip select pin. This pin must be asserted high during a read or a write. Also an	internal 40kΩ pulldown resistor is connected to ground. Note: Previous datasheet revisions refer to CE as RST. The functionality of the pin has not changed. 6 (I/O) This is the I/O pin for the 3-wire serial communication. This pin is characterized as Input/Push-Pull output, and it has an internal 40kΩ pulldown resistor to ground. 7 (SCLK) This is the clock pin SCLK where it synchronizes data movement on the serial interface. This pin as an input it has also an internal 40kΩ pulldown resistor to ground. time and date in the absence of primary power. In systems using the trickle charger, the rechargeable energy source is connected to this pin.